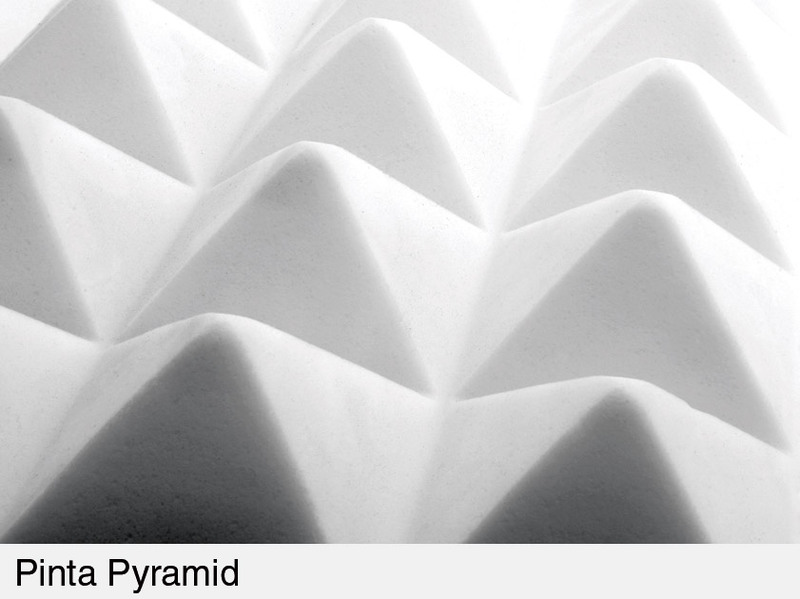 German manufacturer Pinta (formerly Illsonic and Illbruck), is a specialist in use of foam materials for acoustic correction and noise reduction. Their ‘individual’ applications include specialised panels to reduce noise transmission inside cars, noise reduction techniques for laser computer printers, a variety of ambient noise control systems for industry, and even specialised environments like shooting ranges. The professional audio user requires acoustic treatments to improve the acoustics of a room or hall; this is the specialist end of Pinta’s work. Products for the studio and theatre were originally only available in a material called S35SV, a polyurethane foam. This remains available, its main advantage being resistance to physical damage. However, demand for “non-flammable” solutions to acoustic problems led to the introduction of Willtec, a melamine-based foam, which whilst a little more brittle than polyurethane has the big advantage of non-combustion, desirable for many users and essential for others. The Willtec material now has the ‘ultimate’ class 0 fire rating, making it suitable for use in public venues. Copies of the approval certificate are available free on request, to aid liaison with fire officers, stock code 02-205. Very confusingly, Pinta S35 tiles are marketed in the USA as Sonex, and Pinta Willtec tiles as Sonex 1. The American Sonex tiles are manufactured in imperial sizes whilst the European Pinta are metric; otherwise the two products are virtually identical. Pinta products (registered trademark) are manufactured by Pinta GmbH in Germany. Pinta tiles are made with two styles of surface profile – ‘sculpted’ and ‘pyramid’. The choice of which type to use is based on performance required and budget available. Sound pressure waves are absorbed by the open cellular structure of the foam, and the contoured profiles provide the ability to trap waves at all angles of incidence, progressively weakening them as it bounces between the sides of the troughs in the surface. Both profiles are produced by cutting (rather than moulding) to ensure the front face is fully open-celled. All tiles have bevelled edges to allow fitting in any combination, always presenting a ‘finished’ edge face. This complex design pattern is the main reason why Pinta outperforms other acoustic tiles. It optimises absorption from all angles, the differing dimensions of the profile varying with different tile types for different applications, from extremely deep profiles for high performance wide-band studio work, to low cost shallow profile for machine noise reduction, where low frequencies are less significant. The deeper the profile, the better the low and low-mid frequency absorption. The complex shape of the profile leads to a smoother attenuation curve across the frequency spectrum, and a far greater absorptive surface than all conventional noise absorbing systems. This has a regular pyramid shaped profile, and is a little cheaper than the sculpted profile. It is also available in various thicknesses. Pinta tiles are manufactured in two main materials, plus one special purpose material. Choice of material will depend principally on fire-rating requirement and physical performance. ‘Willtec’ offers the best fire-rating, but is also a little harder to the touch and therefore more prone to physical damage than S35SV. This is a newly developed foam with a melamine resin base. 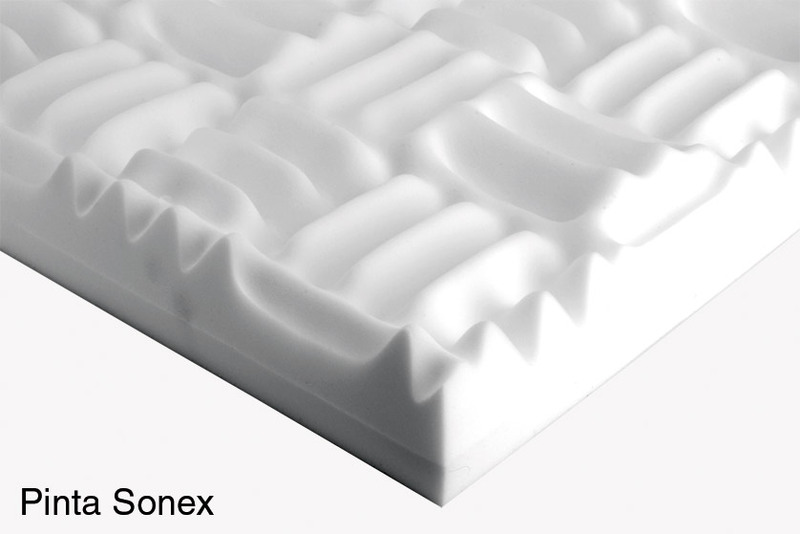 The high quality properties of this foam, which under normal conditions does not burn independently, are essentially due to its physical make-up. The foam structure consists of a spacious meshwork, the individual struts of which are extremely soft and flexible because they are thin. 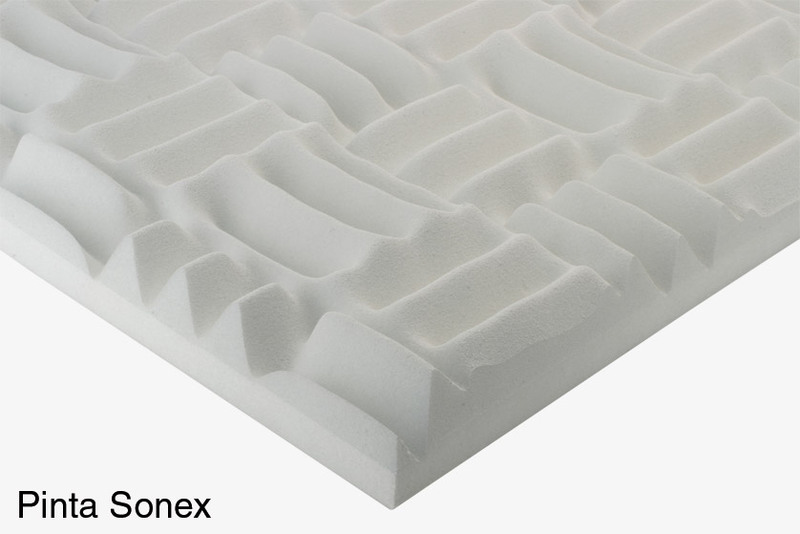 Thus, out of the original brittle material, a soft elastic, membrane-free and completely open-celled foam is produced, which is suitable for numerous sound absorption applications. Willtec can be used in all those places where normal or highly inflammable materials cannot be applied, and where mineral wools and impregnated foams, which have up to now been used, have to be replaced for weight reasons. Willtec is characterised by its ability to sustain high temperatures (>150°C), its low density (11kg/m3), and its exceptionally good sound absorbing properties. It is resistant to organic solvents and a variety of diluted acids and alkali. For flammability and burning performance, Willtec complies with national and international regulations, and receives the highest rating possible for an organic material. Under intense heat it does not start to drip, and produces no after-glow. Moreover, it produces only very small amounts of fumes in these circumstances, and these contain no possible toxic elements. This foam has the best possible rating in spread of flame tests. It is rated class B1 to DIN4102, and class 0 to BS476 (part 6). It is available as tiles either in its basic white uncoated form, or with a coloured surface finish. The most popular colour is light grey, which tends to mask dust and dirt discolouration building up over the years. All data and prices shown below are for the coated versions. 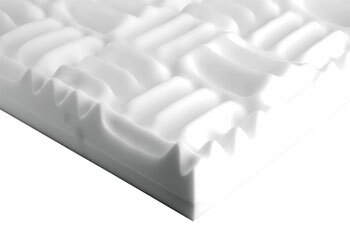 This is a polyurethane foam, with excellent sound absorption properties. Its soft structure gives it good resistance to physical damage. It is always supplied coated with a flame retardant spray, usually white/grey, but other colours are available. The effect of this coating is that the tile is self-extinguishing in the event of contact with a flame. In most applications this is satisfactory, class 1 ratings only normally being called for in buildings with public access and adjacent to fire exit routes. This foam (with coating) is rated class B2 to DIN4102, and class 4 to BS476 (part 7). Uncoated Willtec is pure white. S35SV is a dark grey, but is never supplied without a coloured coating. All types of Willtec tiles are available in uncoated white. S35SV tiles are stocked in white/grey. Note that due to the different colours of the base material it is not possible to achieve a surface colour match between tiles of Willtec and tiles of S35SV (this is why the terms ‘light grey’ and ‘white/grey’ are used). Any RAL reference colour can be supplied to special order, subject to a minimum quantity of 100m² and subject to a small additional charge. Sculpted profile, available in 20, 35, 45 and 65mm thicknesses, in both Willtec and S35SV. Willtec tiles are 1250mm x 625mm, S35SV tiles are 1000mm x 1000mm, and are suitable for a wide range of applications. A special high-performance version of Sonex. Audio Willtec tiles are 90mm thick, 600mm x 600mm. A special version of the 50mm thick Sonex (in both Willtec and S35SV), of sandwich construction, incorporating a 2mm membrane of high density material (2kg/m2) which serves to attenuate noise transmitted through the tile, and give some degree of sound isolation. This will be found useful where an acoustically treated area has to be created from within an existing building but where no structural changes to provide isolation can be made (eg. schools, colleges etc). Available in both Willtec and S35SV, tiles are 625mm x 625mm x 65mm in Willtec, 1000mm x 500mm x 65mm in S35SV. Pyramid profile economy absorber, sometimes chosen for aesthetic reasons. Available in 50, 70 and 100mm thickness. Tiles are 1200mm x 600mm. This series only available in Willtec. Installation of all types of Pinta tiles is simple, and cost of installation very low. Tiles can be cut with a sharp knife, and are usually glued into position, though other fixing methods can also be used. Canford stocks a special low-volatility silicone based adhesive specifically suited to this application, which permits ‘easing’ of the tile to its exact position after it has come into contact with the mounting surface, making accurate location and alignment very easy. The adhesive is supplied in standard industrial mastic cartridges, each tube containing enough adhesive for about 2m² of tiles mounted onto a rough surface, or 2.5m² onto a smooth surface. Suitable mastic guns are also stocked. There are sometimes slight differences in colour between batches of the painted versions of these tiles (Light Grey). If it is likely that additional tiles may be required to match with existing tiles, we strongly advise either buying enough tiles to meet the full requirements in one order, or to use the white (unpainted) tiles which do not vary in colour. Approximately equal quantities of ‘male’ and ‘female’ tiles will always be supplied. The most popular types of Pinta tile are held as stock items. Other, more specialised types, are available to special order and are only available in full boxes. Please allow 4 - 6 weeks for delivery of special order types.